1.Preheat the oven to 180ºC, gas mark 4. Place the apples in a saucepan with the sugar, lemon juice and a splash of water and bring to a simmer. Cook gently for 8-10 minutes, stirring occasionally until the apples have softened. 2.Remove from the heat, stir in the custard then pour the mixture into an ovenproof dish. 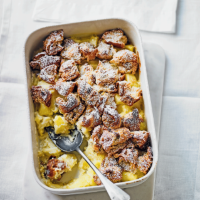 3.Tear the hot cross buns into small pieces and tip into a large bowl, add the butter, toss to coat then tip over the apple and custard mixture. 4. Bake for 20 minutes until golden brown then leave to stand for 5 minutes. Dust with icing sugar and serve with vanilla ice cream.